Today I gave a talk to a packed NYC.rb about crafting a Ruby-on-Rails course for developers. I’m working on a blog post about classroom education, but in the meantime, here’re a few links. I want to thank the audience for attending en-masse, the students who demoed their Stashboard clones, GA and the course sponsors. Some of the students are looking for a Ruby-on-Rails programmer job, reach out! 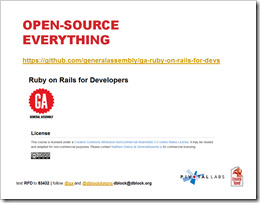 Crafting a Ruby on Rails Course for Developers was published on March 14, 2012 . See a typo?